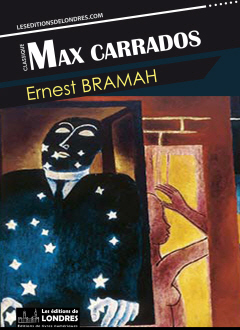 “Max Carrados” is a compilation of short stories published in 1914 by English author Ernest Bramah. It is the first appearance of the blind sleuth Max Carrados whom, accompanied by his faithful but not always insightful Carlyle, was created as a rival to Sherlock Holmes and quickly found a strong following amongst readers of The Strand. “Max Carrados” will be followed by “The eyes of Max Carrados” in 1923, “The specimen case” in 1924, the “Max Carrados mysteries” in 1927, and “The bravo of London” in 1934. Carlisle is a private investigator and high school friend of Carrados whom he sees again, for the first time after many years, in his Richmond home. Carrados instantly recognises him from his voice, having become blind following an accident which caused amaurosis. Carrados has been made independently wealthy, and enjoys solving crimes as a pastime. He has a manservant named Parkinson who has developed an acute sense of visual observation and helps him solve crimes. Carrados has developed his other senses to such an extent he can read printed matters down to a certain font size, recognises voices from the past, has an acute sense of smell, etc. Carlyle himself has a strange history. Prior to becoming a private investigator, he was a solicitor, but was struck off because of his involvement in a fraudulent case. Due to this mishap, he since had to change his name to Carlyle. If Carrados resolves the first enigma thanks to his encyclopaedic knowledge (including that of ancient coins, for example) and without leaving the comfort of his home, he is not an early English Poirot. He often moves around, and even braves danger in a daring fashion (see the last short story: “The game played in the dark”). “The coin of Dionysius”: the first short story where the characters are introduced, and where Carrados resolves a mystery involving ancient coins without leaving his armchair. “The knight's cross signal problem”: a horrible train accident for which an innocent man is accused of negligence. Carrados will find the guilty party, a young Indian man, responsible for the first case of anticolonial terrorism. “The tragedy at Brookbend cottage”: Lieutenant Hollyer's sister Millicent is married to a man named Creake. Hollyer is convinced Creake wants to murder Millicent. How do you resolve a murder which has not been committed? “The last exploit of Harry the actor”: one of the best Carrados short stories, an impossible mystery that revolves around safes being burgled. “The tilling shaw mystery”: an unsolved murder in rural England. “The comedy at Fountain Cottage”: a slightly more light-hearted and convoluted one, why would anyone throw kidneys into Elsie‘s garden? George Orwell was a reader and admirer of Bramah. Not only was he inspired by The secret of the league for his 1984, he also wrote that, along with those by Conan Doyle and Freeman, the “Max Carrados” stories were the only ones worth re-reading since Edgar Allan Poe.